Germany’s Bild newspaper has promised to accept Geoff Hurst’s 1966 World Cup goal was over the line, and allow Brits first use of hotel sunloungers – so long as we vote to remain in the EU. The tongue-in-cheek front page also reveals they will stop poking fun at Prince Charles’ big ears, as well as play without a goalkeeper at the next penalty shootout against England. 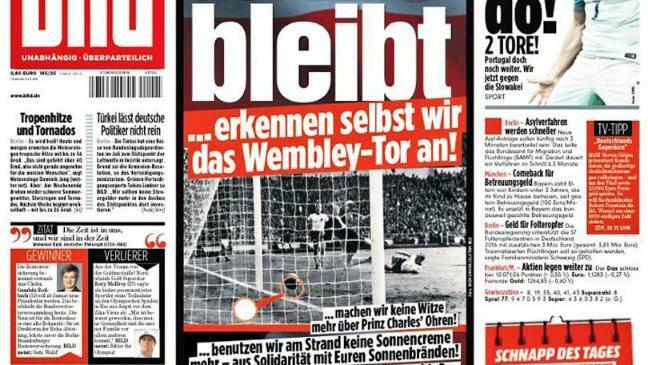 As Britons went to the polls to vote on staying or leaving the EU, Bild plastered over its front page: “Dear Brits, if you remain in the EU … then we ourselves will recognise the Wembley goal,” suggesting they had not quite got a handle on Scotland, Wales and Northern Ireland having no interest in that particular sporting moment. And it pledged that Germans would go without suntan lotion this summer – a dig at Brit holidaymakers who regularly turn pink before burning in the holiday sun. Further helpful German offerings include supplying baddies for all future James Bond films, winding the clocks back an hour to match the UK, and introducing an EU ban on frothy beer.